We made this video a while back, and I’ve been paying off our web guys to keep it from ever seeing the light of day since then. My butcher skills far exceed my acting skills… in short, I’m a doofus with a sharp knife. Lately however, I have come across several articles on hanger steaks, and was amazed at how the removal of the nerve was butchered (and I don’t mean that in a good sense). In this video I demonstrate how to trim a hanger steak, but my good intentions turned into a new nickname of “Slap-Happy Bryan”. Watch the video, you’ll see what I mean. A little history on the hanger steak; Way back when, these were called a “butcher’s steak” because there was such little demand for them and we always take home for dinner what we don’t sell. The cut started to gain traction when more people discovered how tender and versatile they were and presently they enjoy a good bit of limelight as ‘bistro-style’ steaks in restaurants. Hanger steaks are part of the diaphragm muscle, but what makes them so tender is that the giant nerve running right down the middle does all the heavy lifting. The actual hanger steak, or “hanging tender” just goes along for the ride. Having said that, if you leave that nerve in when you cook it, start chewing on Tuesday, you’ll be done on Thursday. About 4 years ago I was flipping through a food magazine and saw an article on Hanger Steaks. I wasn’t surprised to see it featured, but what caught my eye was the chef’s statement “the only drawback to the Hanger is that it could be a little chewy.” What the hell? 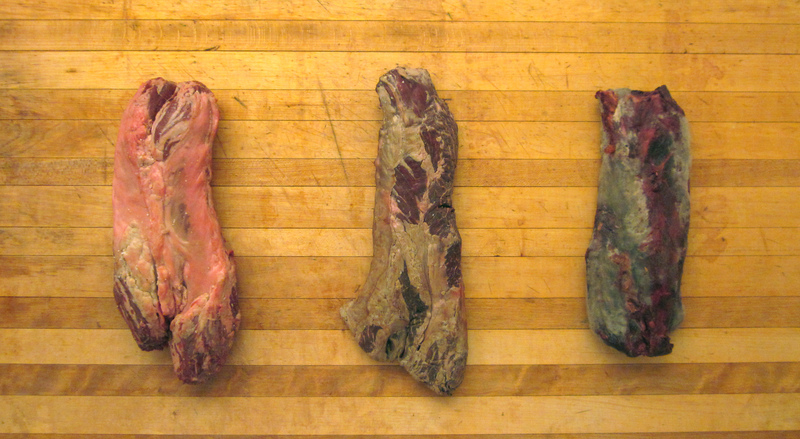 I take a close look at the photo, and sure enough, in the middle of each slice was the nerve… Recently, I was reading yet another article on hanger steaks, and while the instructions to remove the nerve were there, the author suggested cutting on either side of the nerve to remove it. While this would get the job done, it also wastes a great amount of meat. I never imagined that Hangers would be sold with the nerve left in, so for any of you who happen to run across this locally, use this video as a guide on how to trim, and you’ll get the most bang for your buck. For any chefs out there this trick will reduce your trim loss, and give you an extra 15-20% on your margin. Now, normal hanger steaks will weigh between 1.5-2lbs each when trimmed of facia and center nerve; these dry aged hangers will come in somewhere between 1-1.5lb due to the reduced moisture and additional trim required to find the damn thing under all that age. Here’s the catch: we’re only doing 100 of these beauties, and they won’t be ready to ship until the week of the 17th. Thanks to my big mouth, the list is already starting to fill up, so get your order in before they’re all gone!